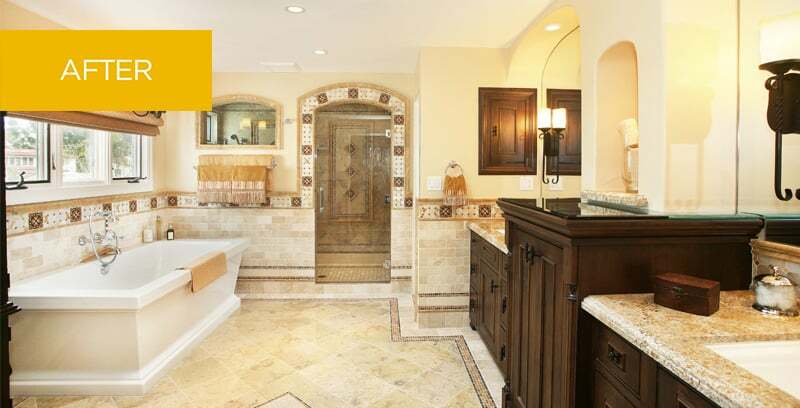 The owners of a historic home in the Spanish Revival style wanted a grand master bathroom as a respite from their busy lifestyles. The bathroom needed to align with the original character of their early 1900’s home, while providing modern function, convenience and luxury. Bringing natural light into the room was a priority. A skylight, plus carefully selected paint and tile colors, help to balance dark and light aspects. A rich mixture of materials, including gleaming Sahara Gold tile and a medallion inlay on the floor, infuse the room with light and color. A freestanding rectangular tub communicates understated elegance. The opulently large shower is framed by a graceful arch of artistic hand-painted tiles. In keeping with the home’s historic nature, the bathroom’s aesthetic is classic, sophisticated and ornate, while also providing the owners with the ease and comfort of modern living.